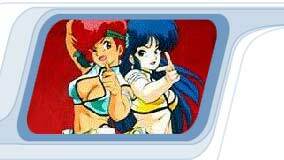 Description: KEI and YURI, known officially as "The Lovely Angels", are two troubleshooters for the WWWA who have gained the unflattering nickname of The Dirty Pair. In AFFAIR ON NOLANDA, these Lovely Angels find themselves trapped in a bizarre arboreal wonderland on the planet Ukbar, where a routine investigation reveals a deadly caper of galactic conquest. As the mystery unfolds, the two special agents tangle with a pair of villains who will stop at nothing in their quest to attain ultimate power. The girls are forced to deal with unexpected psychic attacks, brutal murders, sabotage and wild, improbably mind games as they cope with their formidable adversaries. The finale, a classic chase sequence, zooms by with ferocious vitality and non-stop action. This is a exciting comic adventure, recommended. The production values are high. The character designs are different from those in all the other Dirty Pair anime, except.perhaps for the cameo in the Crusher Joe movie. Kei and Yuri are thinner, more mature, with figures that are not so striking. They also have the psychic sensitivity they had in Haruka Takachiho's original novellas. The Dirty Pair's psychic visions and dreams, and the happenings in the forest of Nolandia (especially a scene where a heavily armored soldier flees terrified from a unicorn, which hunts him down and kills him) are chilling and unnerving. A sinister (and somewhat incoherent) plot is going on to manipulate nature, but nature is fighting back. Toward the end, the Dirty Pair go in separate directions and give us two wonderfully exciting and well-paced parallel chase scenes: Kei is fleeing/leading a killer robot with an uncoincidental resemblance to the Terminator, while Yuri chases the chief bad guy, by taxi, bicycle, roller skates and on foot.